I liked it. 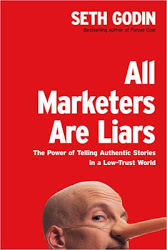 And his thesis, as he calls it, about the world of marketing and the authentic vs. the in-authentic is very good. His position is pretty accurate - to market yourself (person, organization, business, idea, etc.) then you have to tell a story that fits into the frame work of people's already constructed worldview. That hopping on a bandwagon or attempting to alter someone's position is pretty much a waste of time. Where I got caught was in wanting more ... substance. I wanted a little of that "how to" guide to come along somewhere but it never showed up. I wanted him to write about where to go from here, what signs to look for, and how not to fall into that trap other than, "don't do this.."
In all I think the book could have been a few chapters shorter. Sorry Mr. Godin, I really was rooting for your position! What do you think? Of course, you have to read it first.